An instant’s glance may indeed be sufficient to form a general impression of a painting, but a full appreciation of its individual parts often requires protracted examination. This two-stage visual process was a tenet of optical theory in the fifteenth century, derived from the writings of the well-known Persian authority Alhazen (965–1039), who noted that our immediate visual perceptions are often succeeded by more attentive and contemplative scrutiny through which we build up the details necessary to form a complete mental image. Fifteenth-century painters often structured their compositions in a manner that prolonged the second stage of visual apprehension. In this way, their paintings accommodated the same sort of sequenced meditation discussed above in relation to multiepisodic polyptychs. 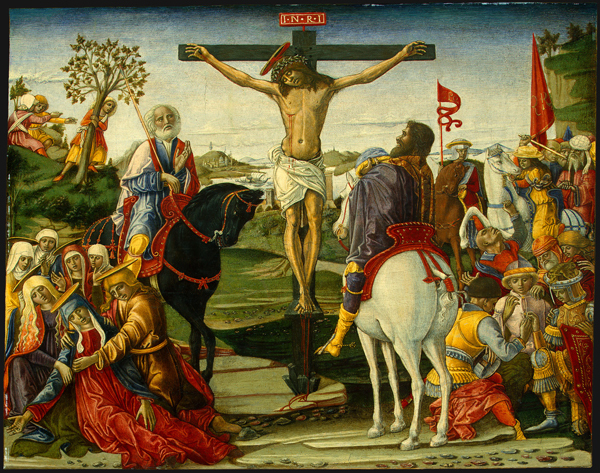 In The Crucifixion, probably 1491, by Benvenuto di Giovanni, the gestures and facial expressions of more than twenty figures articulate distinct dramatic vignettes that serve as emotional prompts—visual reminders of the excruciating circumstances of Jesus’s death, which worshipers contemplated at length during their devotions. Gazing at one group and then another in turn, the worshiper vicariously experienced the agonies of the scene as if events were unfolding in real time (see “Painting as an aid to religion”). 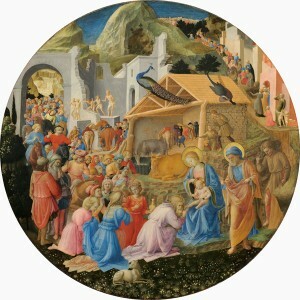 In the remote distance, at upper right, a procession of figures, some on camels, descends a hill. Disappearing briefly behind two centrally placed buildings, the figures reemerge at far left, streaming through an archway and proceeding toward the foreground. Dramatic expressions of wonderment, reverence, and curiosity dot the crowd, intermittently arresting our attention. Stable boys attend to horses. Women cluster to chat in a doorway; nearby, children cling to their mother’s skirt. A group of seminude men clamber over a ruined wall to seek a better vantage point. A dog in the foreground rests. Farther back, a cow does the same, near a donkey with its head lowered to eat. A peacock and a pair of pheasants perch on a roof. The sheer number of narrative vignettes and ornamental details overwhelms our visual sense. The complexity of the composition seems calculated to defy rapid assimilation, as if to ensure that viewing time begins to approximate the unfolding of events in real time. Painted for display in the bedroom or antechamber of a grand private house, or palazzo, the tondo served not only as a devotional object but also as an attractive element of decor, a precious luxury item conveying status. The imagery was constructed in a manner calculated to prompt and sustain attentive viewing. Painters devised equally complex compositions for the secular subjects that ornamented domestic architecture and furnishings. In the crowded battle and processional scenes depicted on the long panels of bridal dower chests (cassoni) and inset wall ornaments (spalliere), painters embellished the basic circumstances of the narrative with invented incidents and details that, again, draw out the viewing process. Competing vignettes and crowds of figures actually reduce narrative clarity and impede interpretation in many of these objects. Lived with and scrutinized on a daily basis, however, they may have been used primarily as domestic conversation pieces, subjects of perennial examination and debate. 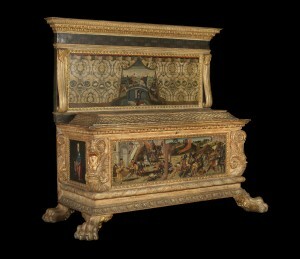 This is a painted cassone made for the wedding of Lorenzo di Morelli to Donna Viaggia di Nerli, depicting Camillus confronting the Schoolmaster of Falerii (front panel), Prudence and Temperance (at the two ends) and the Ordeal of Mucius Scaevola (spalliera) with the Morelli arms (right corner) and Nerli arms (left corner).